In the early days of Tablet we struggled to find ski hotels that were as unique and full of personality as the urban boutique hotels we loved so much. It’s a type of hospitality that, understandably, often prizes comfort and ease over novelty and unfamiliarity. 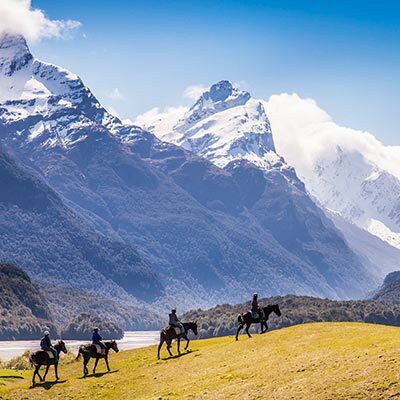 But more and more ski hotels are distinguishing themselves by creating memorable and unusual experiences to go along with the traditional amenities that make them so desirable after a day on the slopes. Standards have gone up, and the examples below are the pinnacle of their craft. 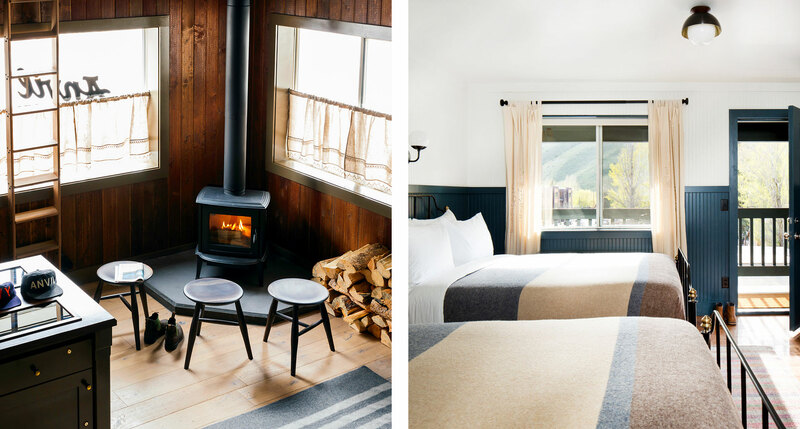 Retro-rustic design is all the rage in many of America’s urban boutique hotels, and it’s surprising it took so long for someone to apply a similar approach to the modern ski hotel. Jackson’s own Anvil Hotel is what we’ve been waiting all these years for: unpretentious cool, a fine little restaurant and bar, and extraordinary skiing thanks to the nearby Jackson Hole. Its unique silhouette is unmistakable, and architecture fans might not be surprised to learn that this slopeside lodge took lessons from Le Corbusier’s vision for supremely rational high-modernist city living. 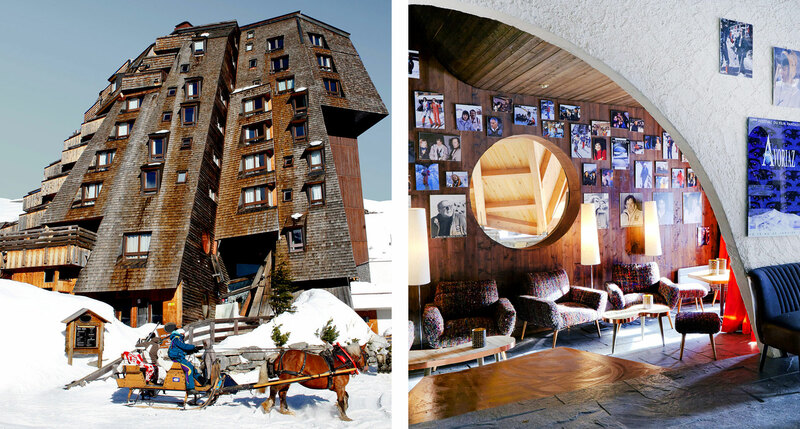 It’s been redesigned in the intervening years, but even in its modern guise it’s the ski hotel of some alternative future, as a boutique-hotel visionary auteur might have imagined it circa 1965. 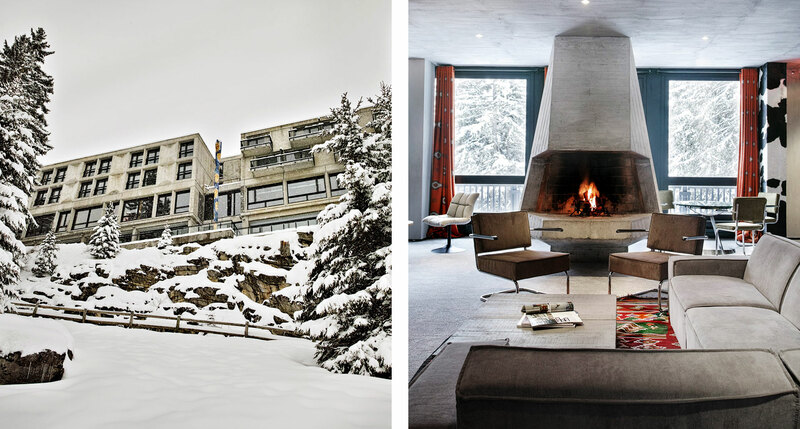 Here’s another French ski hotel that’s haunted by Le Corbusier’s ghost. 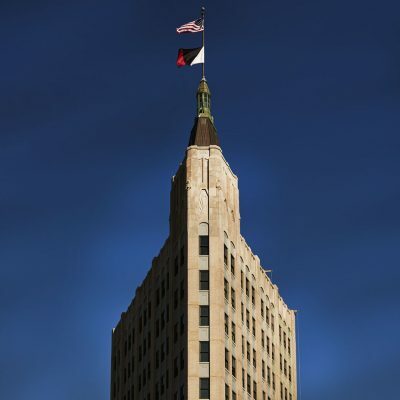 In this case it’s less a function of its plan than of its unapologetically Brutalist construction and its industrial-modernist interior design. Concrete is back, in a big way, and here’s proof that, in the right hands, it can be just as cozy as blonde timbers and overstuffed armchairs. California’s wealth of modernist motels is an untapped resource, now that mid-century design is back in style. 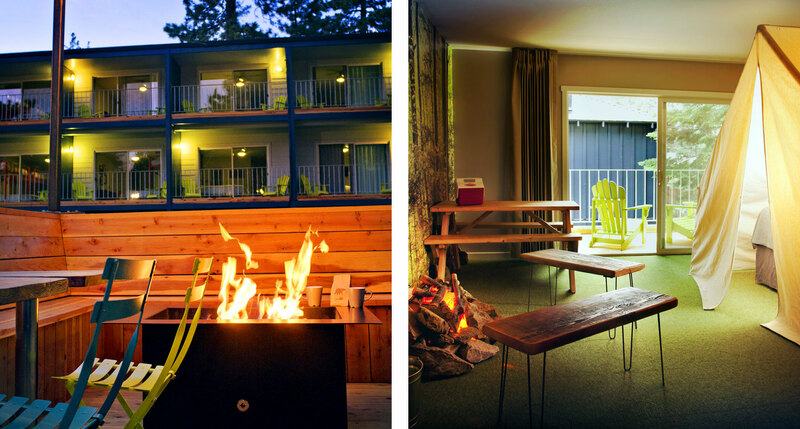 Basecamp Tahoe South goes low-frills and high-fun, with an atmosphere that perfectly captures the grown-up scout-camp vibe and a location that offers easy access to the slopes at Heavenly Mountain, whose gondola is a short walk from your door. Hotel Grau Roig is located in the town of the same name, in the Andorran Pyrenées, and while its exterior looks cozy enough — to the untutored eye it’s something like a brown-brick Bavarian lodge — it’s what’s inside that counts. Namely, rooms and suites that wouldn’t look out of place in just about any urban European design hotel, and two restaurants, including the unique Theatre of Wine. 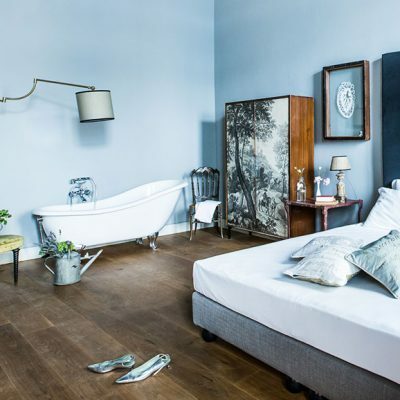 It’s exactly what it sounds like: a 19th-century schoolhouse converted into an intimate little 12-room boutique hotel. 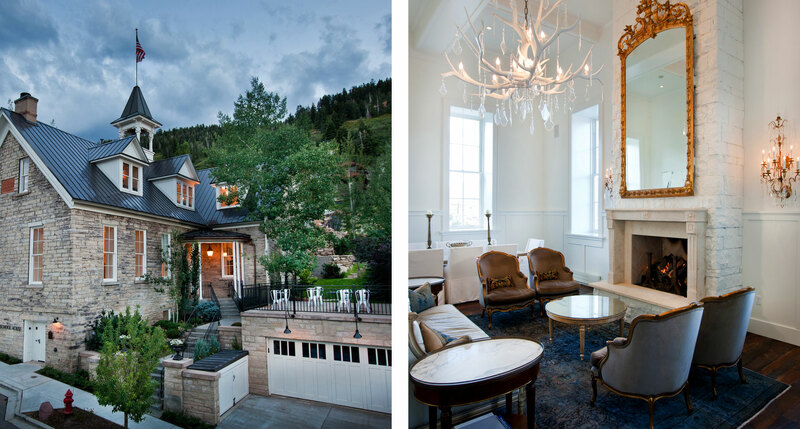 And sacrifices in the name of small size are minimal — there’s an outdoor pool, a private chef, in-room massage by appointment, and it’s all walking distance from Park City’s in-town ski lift, with access to the best the Rockies have to offer. And then there’s the classic wood-paneled Swiss chalet. LeCrans is notable for the way a recent renovation transformed it from an archetypal Alpine lodge into something far more luxurious. The rooms, with their jetted tubs and espresso machines, are impossibly plush, the spa is state-of-the-art, and the restaurant is the proud owner of a Michelin star. The Austrian region of Tyrol is a four-season mountain wonderland, but Das Kronthaler is at its most spectacular during the snowy season. 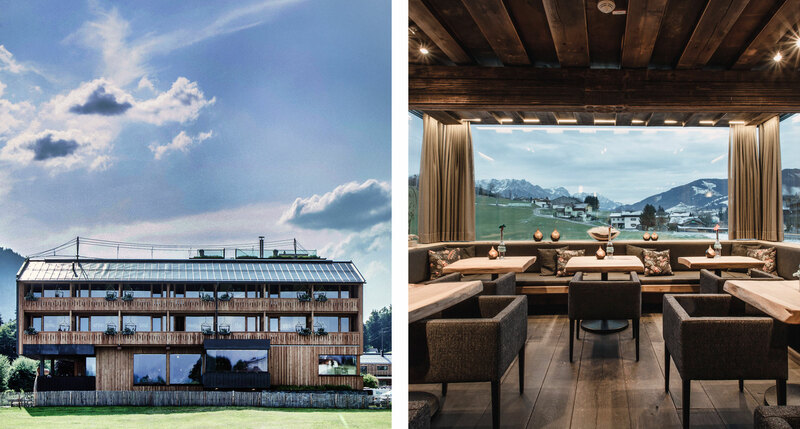 Its rooms are equal parts Alpine coziness, contemporary cool, and modern luxury, and the restaurant is of particular note, serving a hearty and refined breakfast, lunch, and dinner in near-comical abundance. They describe it as “urban soul meets the Alps,” and you’d have to say they hit the nail right on the head. Though it’s made of the same rough-hewn timbers as any other lodge, it’s fun, funky, and contemporary, aimed squarely at the sort of youthful travelers who appreciate not just gondola access but the extravagantly named Flying Fox XXL Mega Zipline as well. 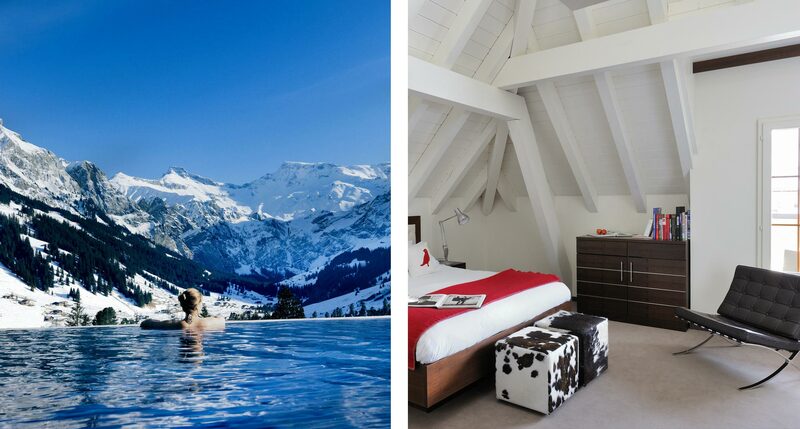 The Cambrian has the ski-resort basics covered, from ski facilities to pools to the stylish little spa, and the Italian restaurant is an appealing après-ski venue. 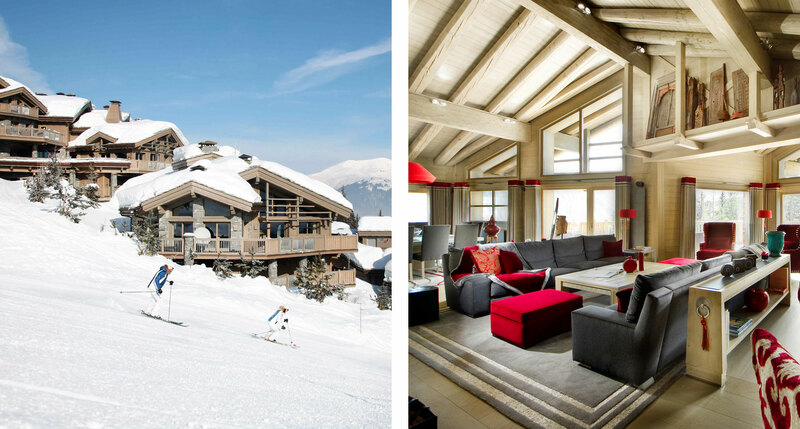 What sets it apart is the style, an appealing blend of minimalist modernism and a touch of chalet chic — as well as some truly extraordinary ski runs and view you’ll remember forever. 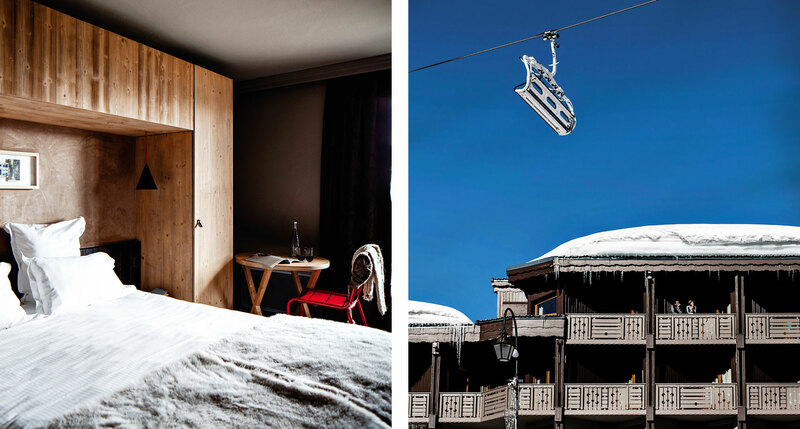 The most stylish ski hotels happen to be in France, and Le Val Thorens, in the resort town of the same name, is among the most stylish of them all. 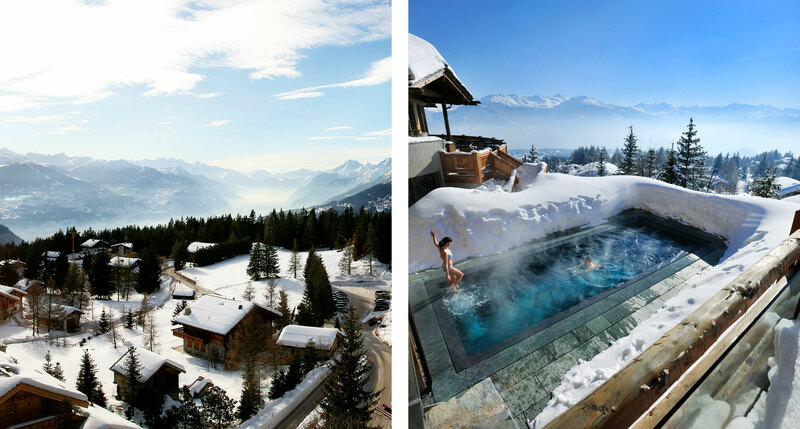 A 2013 renovation turned a trusty old stalwart into an inspired and inspiring contemporary luxury hotel — along with a list of wintertime activities as long as your arm, including access to over 600 kilometers of pristine pistes. 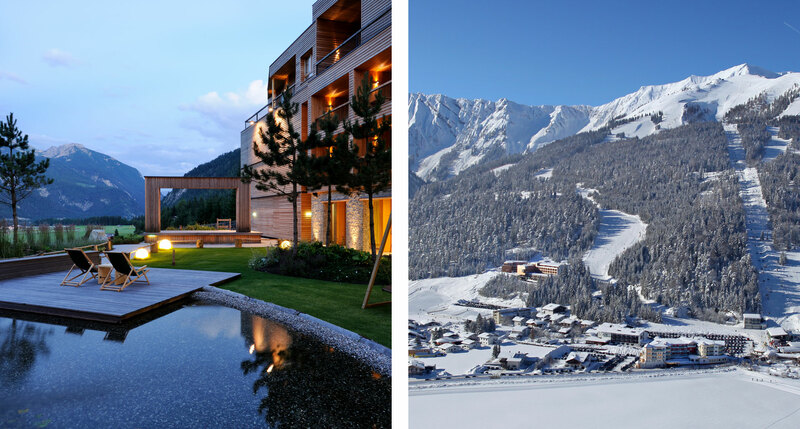 The glamorous hamlet of Courchevel 1850, the highest of four villages comprising one of Europe’s most famous ski resorts, is the setting for Le K2. 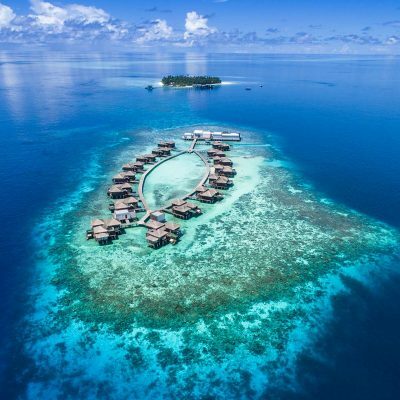 It calls itself a luxury hotel village, and for good reason: though it contains just 34 rooms and suites, it’s got the services and facilities of a much larger hotel, and feels perfectly at home in this most high-end of resort towns. Don’t let Aspen’s reputation as the Hollywood of the Rockies distract you from the fact that there’s some truly phenomenal skiing here. 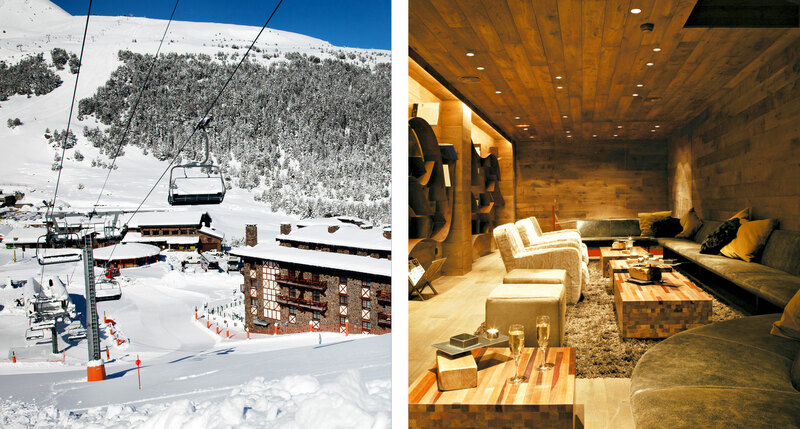 And who better to design an Aspen ski hotel than Hollywood’s own Kelly Wearstler? 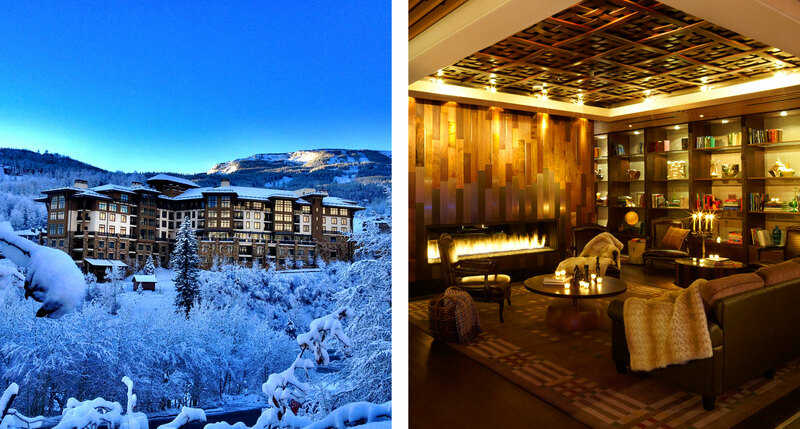 The Viceroy Snowmass sits at the foot of the largest of Aspen’s four ski mountains, offering ski-in/ski-out access and a perfectly glamorous respite at the end of a day on the slopes. We’re not about to forget the Northeast USA. 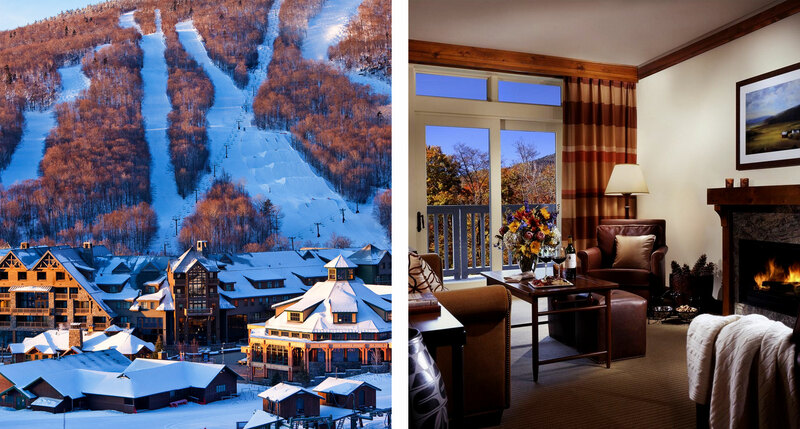 This is a newish addition to Vermont’s venerable Stowe Mountain Resort, and not only is it stylishly built from local timber and stone, it’s also a capacious village-style resort, with studios and suites in the main lodge and freestanding mountain cabins. 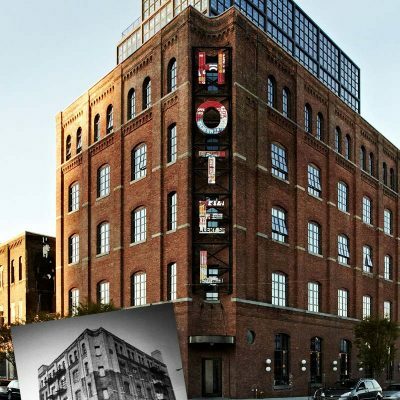 It’s an upscale experience, but one that never loses touch with its location’s rustic charm. Beaver Creek is about fifteen minutes to the west of Vail, and it’s the newer and somewhat less developed of the two, though by no means non-luxurious. 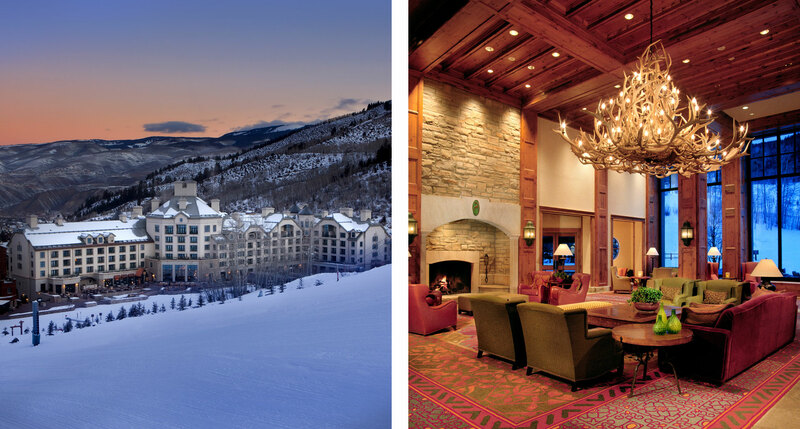 The Park Hyatt is placed right at the foot of the lifts, at the top of the Beaver Creek village, something of a cross between a massive stone castle and a rustic Rocky Mountain lodge. 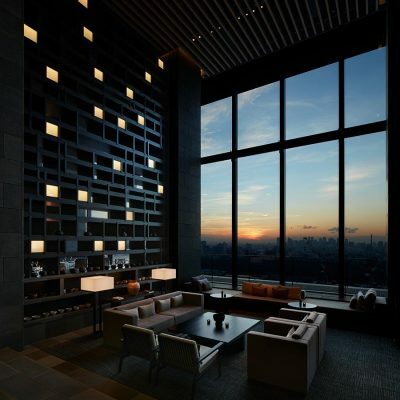 And if there’s one thing you can rely on in the world of hospitality, it’s that Park Hyatt means tasteful extravagance, in Colorado or anywhere else.